I last posted on the nature deficit disorder here. While catching up on blog-reading, I found this link to a Washington Post story via Whymommy over at Toddler Planet. The article expresses concerns over nature’s diminishing presence in the lives of our children, and it’s worth a read. It’s sad but true that unless we make a special effort, the next generation of children will experience less of nature than us. My father talked of catching guppies in drains and fighting spiders as a child. Today, we have to go somewhere before we can be surrounded by nature, and ahead of that douse ourselves head-to-toe with insect repellent so we don’t get dengue. And here in Singapore, it’s hot, it’s sweaty, and it’s so much easier to go to a mall or just stay home watching TV and playing videogames. But let’s not be lured by what’s easy, nor put off by what’s hard. Is being outdoors amid nature a good thing? If yes, for the sake of our children, let’s just do it. Need ideas? Try the Places to Go link above. “Last Child in the Woods: Saving Our Children from Nature-Deficit Disorder” by Richard Louv . Incidentally, Whymommy, whose blog I read regularly, has just been diagnosed with breast cancer. She has two boys aged 2.5 years and 5 months. Would you drop by her blog and give her some encouragement? How Much Would You Pay For A Place In School? This week my eyes were opened to the wild system of debentures in the Hong Kong international school system. In brief, some of the best international schools in Hong Kong issue debentures (a kind of bond) to help pay for construction and other costs. These debentures are then bought by companies for their expatriate employees, or direct by parents, who are then given a place in the school, or at least allowed to jump ahead in the queue. Demand for debentures is now far in excess of supply, leading to vibrant trade and soaring prices. This week, the front page of the South China Morning Post reported that for one school, agents quoted a rate of HK$3 million (that’s about SGD $600,ooo, or USD $380,000) for a debenture. And the school’s official rate is HK600,000! And I thought the Singaporean obsession with enrichment classes was bad…. The Pilgrim family finally cleared our schedules and took off to Sentosa for the last few days of the June school holidays. Granted, it’s not the most exotic of destinations for the Singaporean family. No need for airplanes nor passports, malaria pills nor winter wear. But with three boys, of whom one is just learning to walk, we thought it was the most sensible option. The post on fingerpainting your shower wall drew some interest and, understandably, concerned questions. So here’s an attempt to address them. But first, it needs to be said that my standards for housekeeping are not what anyone would call high. I am content in neatness or in mess, so long as the home remains pest, rodent and odour-free. Since I live in a household of four boys (3 small and 1 big), it seems to me a sensible way to keep my sanity intact. So on to the question of the staining effects of food colouring. On tiles – NO. Not on my shower tiles anyway, which are a vulnerable white and made of glazed ceramic. The fingerpaint recipe is more soap than anything else, and if you wash it off as soon as they are done, it should come off. On grouting – NO. But I should add that my shower is well-grouted and the material probably matters (epoxy?). I took the risk and let them at it. But that’s me, foolhardy mother of three. The safer approach would probably be to make a small batch and test it on a corner of your wall (while the kids are asleep). Leave it an hour or so and see how well in washes off. One of my favourite materials for preschool art and craft is aluminium foil. It’s easily manipulated, torn and shaped by little hands, it can hold its position without glue or tape, and best of all, it’s shiny! 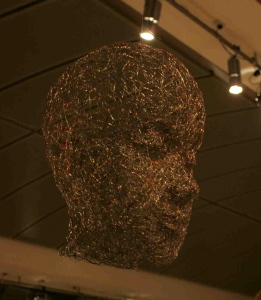 In case it’s not immediately obvious, these figures are crafted out of wire. The last picture is a man on his knees cradling a baby. I loved how the sculptures appeared at once ephemeral and solid. I know the boys like fingerpainting. But then I start thinking about the sticky fingers, the soiled clothing, the mess, and very quickly my mind starts casting about for alternatives. “Your babies are going to be born soon,” declares Porthos. Whoa, I think. Is my son uttering a prophecy? Not quite. The dear fellow runs off and fetches his doctor kit and stuffed toys. In the next few minutes, I have given birth to a bear, a daschund and a pug. Athos joins in the game. My two young doctors check the newborns with their medical equipment, wrap them gently in muslin and pass them to me. I cradle them, thank the doctors, and praise them for their kindness. These boys will make wonderful fathers some day, I think. It warms my heart to see how tender they are. As usual, I have forgotten that we are playing doctor. “And Pug has swallowed a cuckoo clock!” chimes Porthos. And before I know it, my new babies are whisked off to brutal surgery, multiple injections and what looks like near-lethal doses of medicine.